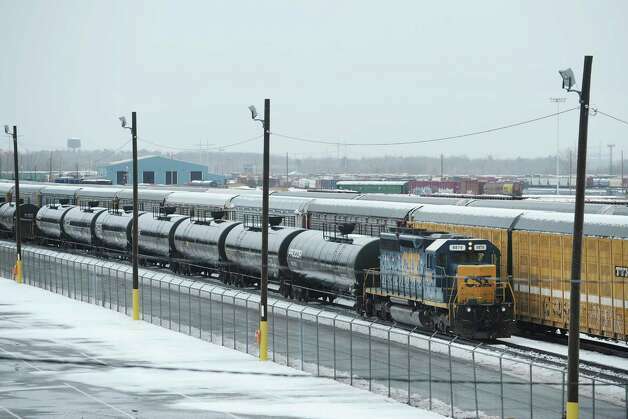 Three Capital Region rail yards were the latest targets in an ongoing "inspection blitz" touted Thursday by Gov. Andrew Cuomo that aims to reduce risks of potential derailments and explosions of massive crude oil trains that are passing through the state. Inspectors also found a tanker with a faulty brake and three "minor defects" among 64 tankers examined for "hazardous materials faults." The earlier inspection of Kenwood tracks had found 36 defects that were repaired. At the CSX-owned Selkirk yard, where 13 tanker cars each carrying about 29,000 gallons of highly flammable crude derailed Feb. 28 but did not spill or explode, inspectors looked at a mile of track and found 20 "non-critical defects" that were to be repaired, according to the governor's press release. The yard is a key transit gateway to much of the Northeast and can handle thousands of freight cars a day. And in West Albany, inspectors examined two miles of CSX-owned track and found seven "non-critical defects" that were to be repaired. Inspectors also looked over two miles of nearby Transflo Industrial tracks and found a broken rail, which was taken out of service. Twelve other "non-critical defects" were also found. Cuomo said the state is "doing everything possible to prevent mishaps and keep crude oil transport safe." In January, he ordered beefed-up inspections of rail yards, tracks and tankers amid a growing national debate over a flood of crude being shipped nationwide on massive trains from the Bakken oil fields of North Dakota. Transportation Commissioner Joan McDonald said the department is "committed to ensuring that the freight rails and equipment meet all standards and do not pose any hazards." Also in January, Cuomo ordered four agencies — DEC, Health Department, Transportation Department, and Homeland Security and Emergency Services Division — to report by April 30 on state preparedness to handle a potential crude oil spill or resulting fire "by rail, ship or barge."